Assuming you work in the internet field, learning to code, even at a beginner/intermediate level, is a very valuable skill to have. You might never be the one writing complicated programs for your company, but you will understand what goes into it and how it works. Plus you’ll be able to create smaller “agile” tools that can make your life easier. Pro tip: Learning a skill or theory is great, but applying it directly to one of your problems is the secret. It’s great to learn how to show all the dog breads in Gdocs using ImportXML, but you will most likely forget all the details of how it works once your done if you aren’t using it in your day-to-day activities. ImportXML is a functionality inside Google Docs that allows you to make calls or queries out on the internet, without ever leaving the spreadsheet. Lots of SEOs have written posts on how to build agile tools to get SEO work done, but ImportXML isn’t bias to the SEO world, you can do almost anything you can imagine with it. 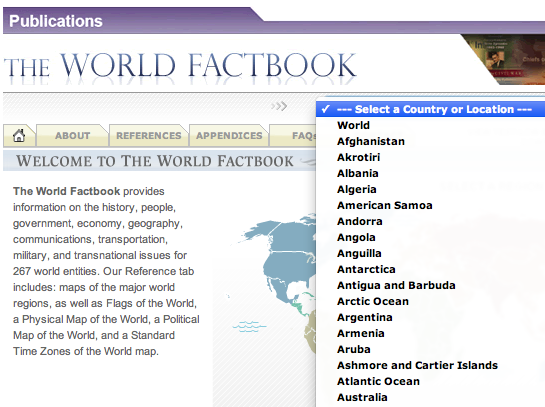 – Create a list of every country from CIA’s World Factbook. 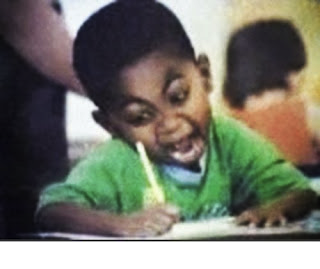 on 300+ pages, then copying all the information by hand! Which made me say noooooooooooo! So how did I come up with that? Well you need to look at the data you need on the page then find it in the source code. If you’ve never written code or used ImportXML before, that query probably looking very complicated, but it’s not. Let’s break it down. The script is the same as before, because we’re looking for the same information, except we want to pull the info in the link (a href). And we still need the full URL and population data. To combine the page specific URL and root URL I used ” =CONCATENATE($A$2,D2) ” and replicated it down the page. CONCATENATE combines two fields into one — so I made field A2 “https://www.cia.gov/library/publications/the-world-factbook/” (without /index.html at the end) and added the country page to it to form the full URL. The first time I did it, I used =CONCATENATE(A2,D2) and copied it down the page. It totally broke. Why? Because I left out the two $ symbols. because I always need the first part of the query to be the URL in cell A2. The last thing I needed to mark off this great accomplishment was the population data for every country. Up until now I had really just set myself (or my spreadsheet) up to do work, but it hadn’t done any yet. 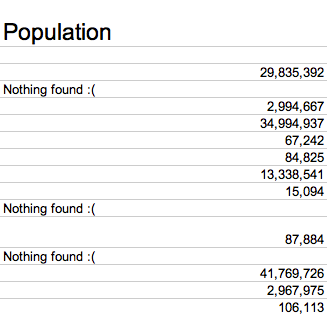 Long story short – I couldn’t get the population data. Yes it should be, but the CIA has done a HORRIBLE job at marking up their site. They should have used unique section names in their html, but instead they made all data “category data” so you cannot get back the response you’re looking for. Hmm.. ok well on the w3schools xpath page it says you can use [number] to select just a certain result like //div for the 9th div which has the population data. Just when I thought it was over… Chris Le from SEER Interactive to the rescue! Chris discovered that Google Docs does NOT support Xpath 2.0 fuctionalities, only 1.0. So the div thing was never going to work. Instead Chris wrote an awesome script to do the same thing for me! He created this scripted called findIntegerInCells under Tools > Script editor inside Google Docs. Then to get the population data, you need to use the function =findIntegerInCells(importXml(E3, “//div[@class=’category_data’]”), “,\d. *est\.\)”) in a new cell. 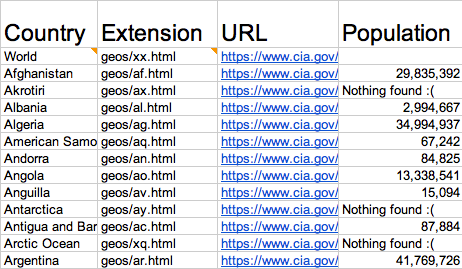 Since almost every population on the CIA site has est. 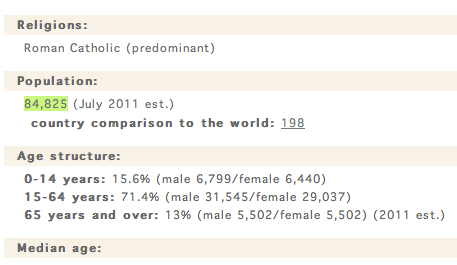 after it, he used that in conjunction with the URLs I made to find the right area and grab the numbers for population. I realize this wasn’t the most complicated problem faced or tool built using ImportXML, but I sure learned a lot about it’s features and how to make it give me what I want. I had to do a lot of reading, digging around Google and trial and error, but I feel much more confident now about building my own tools for SEO, and I hope you will too! If you have any questions I’d love to help in any way I can. There are a lot of other great people in the industry who I’m sure would lend a hand as well. Chris Le of SEER Interactive just wrote a great post and script to fix the new Google SERP scrapping issue with ImportXML. If you’re trying to scrape the SERPs, you need his hack. These posts below do an exceptional job of explaining ImportXML and demonstrating various uses for it. You’ll have a great understanding if you go through a few of these. Do you have an awesome ImportXML tool? Add it to the list! =ImportXML(A1,”//ul[@class=’af’]//li”) -> tried everything but I alawys get an #ERROR! That query is designed to work specifically with the example URL in the tutorial above (ie. the CIA world book website), which uses class markups in their html. 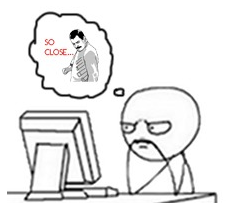 That’s why I used [@class=’af’] to target a specific part on the page, then search the //li inside of it. If you are using a different URL (reference in cell A1) it most likely won’t work, unless that page is also using classes and has an “af” class in the html. Let me know what you’re trying to pull and from where and hopefully I can help out with more specifics. Hi Jordan, thanks for the nice tutorial! Very useful! However the cases are two: I’m either wrong or you made a little mistake. In particular, when explaining the =CONCATENATE part you refer to the “D” column, probably meaning the “C” one. Do you? Otherwise I don’t think it makes any sense. But, again, it’s possibly me who has not understood something of the process. For the problem I’m doing, this formula =index(importxml(A2,”//div[@class=’description’]//p”)) returns me the 1rst p in each div with the class of description. With  it returns me the second one, and so on.. In your example, the information you need is within the div attributes so I don’t know how that works without the script Chris wrote you. Awesome tutorial. The only problem I have is that when the spreadsheet refreshes, it runs the formula again, and that time it does not work. I think this might have to do with the fact that the values that I am referencing update every few minutes – though my URL does not change and the class names do not change so I’m not sure why it breaks when it refreshes. Any thoughts? can you tall me how i can extract the image url ? 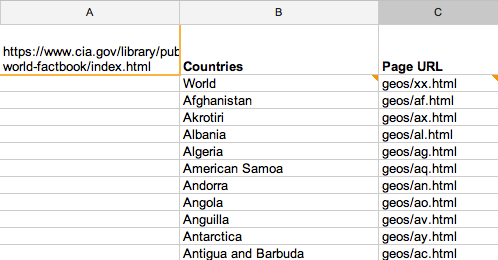 I want to use importxml in a google spreadsheet to collect google search results for different queries in a list. I got it working, but only as far as returning local results. I need to collecte the same search results as when I do a google search manually with geosurf to another coubtry, e.g. Denmark going to google.dk. When you search from google.dk the number of results with geosurf are different than google.dk without geosurf. I am trying to do it with a VPN connection, but I still only get the results that correspond to non-geosurf. So it is starting to look like the url goes out from the server, not the client that is on the VPN. Can you help me understand how the url is send out, and from where? Any idea how I can make it work the way I want? Thanks for the great article … very useful. Is it possible, using a gsheet formula or xpath code, to get it to output the li elements into a single cell. Ideally with a comma separator between elements? Or without a separator, as complete text would be better than multiple cells?